Autoreactive CD4+ T cells play a major role in the pathogenesis of autoimmune diabetes in nonobese diabetic (NOD) mice. We recently showed that the non-MHC genetic background controlled enhanced entry into the IFN-γ pathway by NOD vs B6.G7 T cells. In this study, we demonstrate that increased IFN-γ, decreased IL-4, and decreased IL-10 production in NOD T cells is CD4 T cell intrinsic. NOD CD4+ T cells purified and stimulated with anti-CD3/anti-CD28 Abs generated greater IFN-γ, less IL-4, and less IL-10 than B6.G7 CD4+ T cells. The same results were obtained in purified NOD.H2b vs B6 CD4+ T cells, demonstrating that the non-MHC NOD genetic background controlled the cytokine phenotype. Moreover, the increased IFN-γ:IL-4 cytokine ratio was independent of the genetic background of APCs, since NOD CD4+ T cells generated increased IFN-γ and decreased IL-4 compared with B6.G7 CD4+ T cells, regardless of whether they were stimulated with NOD or B6.G7 APCs. Cell cycle analysis showed that the cytokine differences were not due to cycle/proliferative differences between NOD and B6.G7, since stimulated CD4+ T cells from both strains showed quantitatively identical entry into subsequent cell divisions (shown by CFSE staining), although NOD cells showed greater numbers of IFN-γ-positive cells with each subsequent cell division. Moreover, 7-aminoactinomycin D and 5-bromo-2′-deoxyuridine analysis showed indistinguishable entry into G0/G1, S, and G2/M phases of the cell cycle for both NOD and B6.G7 CD4+ cells, with both strains generating IFN-γ predominantly in the S phase. Therefore, the NOD cytokine effector phenotype is CD4+ T cell intrinsic, genetically controlled, and independent of cell cycle machinery. Nonobese diabetic (NOD)3 mice spontaneously develop pancreatic islet lymphocytic infiltration (insulitis) and subsequent diabetes (1). Diabetes in NOD mice is autoimmune in origin, with a prominent role for the unique MHC class II molecule (I-Ag7), CD4+ and CD8+ T cells, and B cells (2, 3, 4, 5, 6, 7, 8, 9, 10). The NOD literature points to a strong role for Th1-like immune responses, and a decreased Th2 response in the disease pathogenesis; a variety of interventions have shown that diverting the immune response in NOD toward Th2 may prevent disease (11, 12, 13, 14, 15, 16, 17). Multiple T cell autoantigens have been identified in NOD mice, including glutamic acid decarboxylase, insulin, heat shock protein, and islet cell Ag-69; each of these Ags induced therapeutic amelioration or prevention of the diabetic process (18, 19, 20, 21, 22). Genome scanning and subsequent congenic analysis has demonstrated the genetic complexity of the disease process, with at least 20 insulin-dependent diabetes (Idd) genetic loci contributing in a complex manner to cause diabetes (23, 24, 25, 26). The genetic complexity of the disease process and the existence of multiple T cell autoantigens suggests a generalized defect in T cell tolerance (27). Supporting this hypothesis is the demonstration of a greatly expanded pool of autoreactive peripheral T cells in NOD, and the presence of T cells autoreactive to a broad repertoire of self Ags (28, 29). A generalized NOD T cell defect is further suggested by a series of papers demonstrating NOD thymocyte anergy associated with defects in TCR-mediated signaling (30, 31). In addition, this thymocyte defect was ameliorated with IL-4 treatment (32). Using a different genetic model, Fox et al. (33) demonstrated that T cells from disease-resistant congenic strains did not enter the islets, and demonstrated a Th2-like cytokine profile by PCR. Furthermore, this phenotype was mapped near to the Idd5 and Idd13 loci (34). We have recently shown that T cells selected by I-Ag7 on an NOD, but not B6, genetic background demonstrated increased entry into the IFN-γ effector pathway (35). The role of the NOD non-MHC genetic background was confirmed by showing that T cells from NOD.H2b, but not B6 mice, showed the NOD T cell phenotype. These results support the concept of a generalized NOD loss of T cell tolerance. Work from the Sprent lab provides further support for this hypothesis (36). Using the same NOD and B6.G7 strains, they showed that NOD thymocytes underwent decreased apoptosis compared with B6.G7 thymocytes. Furthermore, this resistance to Fas-mediated apoptosis was associated with up-regulation of cFLIP (36). Collectively, these papers support the notion of an intrinsic NOD T cell defect, apparent in the thymus, and manifest in the periphery as autoreactivity mediated via dysregulated cytokine effector function. In this study, we extend our previous studies and show that NOD compared with B6.G7 T cells have a shift in IFN-γ to IL-4 expression which is intrinsic to CD4+ T cells and independent of the genetic background of the APCs. We demonstrate the same result in NOD.H2b vs B6 CD4+ T cells, again implicating the NOD non-MHC genetic background. We show that these cytokine effector phenotypes are independent of cell cycle machinery or APC genetic background. These results support the hypothesis that a subset of Idd susceptibility genes acts to dysregulate NOD CD4+ T cell function. NOD/Lt, B6.NODc17 (B6.G7), NOD.H2b, and C57BL/6 (B6) mice were purchased from The Jackson Laboratory (Bar Harbor, ME). The mice were bred and maintained under specific pathogen-free conditions in the animal facility of University of Pittsburgh Medical Center (Pittsburgh, PA). The mice were used at age of 8–12 wk. Con A was obtained from Amersham Pharmacia Biotech (Piscataway, NJ). PMA, ionomycin, PHA, brefeldin A, and saponin were obtained from Sigma-Aldrich (St. Louis, MO). For Con A stimulation, naive inguinal lymph nodes and spleen cells were collected, washed and resuspended at 1 × 106 cells/ml in complete medium consisting of RPMI 1640 supplemented with 10% (w/v) FCS, 1 mM l-alanyl-glutamine (Life Technologies, Grand Island, NY), 100 U/ml penicillin, 100 μg/ml streptomycin (Life Technologies), 1 mM sodium pyruvate (Life Technologies), and 50 μM 2-ME. A total of 1 ml of the cell suspension was placed in 24-well plates (Falcon; BD Biosciences, Mountain View, CA) and Con A was added to a final concentration of 4 μg/ml. The cells were incubated at 37°C in a humidified 5% CO2 atmosphere. Two to 3 days after the stimulation, the supernatants were collected and the cells were incubated with or without 5 ng/ml PMA (Sigma-Aldrich, St. Louis, MO) and 0.5 μg/ml ionomycin (Sigma-Aldrich) for 3.5 h (37°C, 5% CO2). For anti-CD3 and CD28 activation, minimacs-purifed (Miltenyi Biotec, Auburn, CA) CD4+ cells (>95% purity) at 5 × 105–1 × 106/100 μl were cultured in 96-well U-bottom plates (Falcon) precoated with 10 μg/ml anti-CD3 (BD PharMingen) along with 100 μl of titrated amounts of soluble anti-CD28 (BD PharMingen). The cells were incubated at 37°C in a humidified 5% CO2 atmosphere. After 2 days, the supernatants were collected, and after another 24-h incubation the cells were harvested for analysis. For “mixing” studies, spleen adherent cells were used as APCs. A total of 3 × 106 spleen cells were cultured for 2 h, nonadherent cells removed, and adherent cells were harvested using a cell scraper. A total of 5 × 105 minimacs-purified CD4+ cells were cultured with 2–4 × 104 spleen adherent cells using Con A stimulation as above. For intracellular cytokine analysis, brefeldin A (final concentration at 10 μg/ml) (Epicentre Technologies, Madison, WI) was added to the culture 2 h before harvesting. At the end of the incubation, the cells were stained for 20 min at 4°C with TriColor (R-PE-Cy5 tandem)-conjugated anti-CD4 mAb (CT-CD4) (Caltag Laboratories, San Francisco, CA) in staining buffer (2% FBS, 0.1% sodium azide in PBS). Then, cells were fixed for 20 min at 4°C with 2% paraformaldehyde (Sigma-Aldrich) in PBS and then permeabilized for 10 min at room temperature with 0.5% Saponin (Sigma-Aldrich) in PBS. Cells were stained in permeabilization buffer for 20 min at 4°C with PE-conjugated anti-IFN-γ Ab (XMG1.2, rat IgG1; BD PharMingen) and FITC-conjugated anti-IL-10 Ab (JES5-16E3, rat IgG2b; BD PharMingen). In some cases, anti-IL-4 Ab (BVD4-1D11, rat IgG2b; PharMingen) was used instead of anti-IL-10 Ab. The cells were also stained in the same manner with FITC-conjugated rat IgG2b isotype control Ig (BD PharMingen) and PE-conjugated rat IgG1 isotype control Ig (BD PharMingen). Flow cytometric analyses were performed using a FACScan flow cytometer (BD Biosciences). Statistical analysis of the results was performed using Statview 4.0 (Abacus Concepts, Berkeley, CA). Extracellular IFN-γ was detected by time-resolved fluorometry. The capture Ab 11B11 (anti-IL-4), JES5-2A5 (anti-IL-10), or AN18 (anti-IFN-γ) was bound to flat-bottom microtiter plates that were then blocked with 1% BSA in PBS at room temperature for 1 h. Sample supernatants, cytokine standards, and recombinant mouse IFN-γ were titrated and incubated for 1 h on the plates that were then washed and the detection layer (A3-biotin for IFN-γ) added. Bound detection Ab was detected with Europium-streptavidin (Wallac, Upsala, Sweden). The plates were read on a Wallac 1420 Victor time-resolved fluorometer (Wallac). Statistical analysis of the results was performed using Staview 4.0 (Abacus Concepts). For cell cycle analysis, we used the 5-bromo-2′-deoxyuridine (BrdU) Flow kit purchased from BD PharMingen, according to the manufacturer’s instructions. Briefly, 1 × 106 splenocytes were stimulated with Con A (4 μg/ml). A total of 10 μl of BrdU solution (1 mM BrdU in 1× PBS) was added to each well for 30 min at 37°C at the culture end point on days 1–3. For cytokine analysis, PMA and ionomycin were added to each well and incubated for 4 h, and brefeldin A added and cultured for 2 h. For cell surface staining, the cells were harvested and stained with PE-conjugated anti-CD4 mAb for 15 min on ice. The cells were fixed and permeabilized with Cytofix/Cytoperm buffer (BD PharMingen). The cellular DNA was denatured with DNase for 1 h at 37°C. The cells were stained with anti-BrdU FITC Ab and 7-aminoactinomycin D (7-AAD), and 100,000 events analyzed by FACScan. The measurement of incorporated BrdU (with FITC anti-BrdU) and total DNA content (with 7-AAD) was performed on the CD4+ cells (PE-anti-CD4+ cells). In some experiments, the cells were stained by FITC BrdU and PE-IFN-γ. Single-cell suspension of spleen or lymph node cells (1 × 107/ml) were labeled with CFSE (10 μM) for 5 min at room temperature. The cells were washed three times with RPMI 1640 containing 10% FCS. The labeled cells were incubated with Con A as above at 37°C for 24–72 h. Then, the cells were restimulated with PMA and ionomycin for 4 h. Brefeldin A was added for the final 2 h and the cells harvested. The cells were stained with CyChrome-conjugated CD4 Abs for surface staining, and fixed and permeablized. The cells were stained with PE-conjugated anti-IFN-γ or PE-anti-IL-4 Ab. The CFSE-labeled cells were analyzed using FACScan. Total RNA was extracted from cultured cells using the RNeasy mini kit (Qiagen, Valencia, CA). The RNA was redissolved in RNase-free water and yield estimated by spectrophotometry; equal quantities of RNA were used for analysis. RNase protection assay was performed using RiboQuant from BD PharMingen according to BD PharMingen’s protocol. Multiprobe template set mCK-1 (containing templates for IL-4, IL-5, IL-10, IL-13, IL-15, IL-9, IL-2, IL-6, IF-γ, L32, and GAPDH) was purchased from BD PharMingen. The templates were used to synthesize the [α-32P]UTP-labeled probes (3,000 Ci/mmol, 10 mCi/ml; NEN, Boston, MA) in the presence of a GACU pool using a T7 RNA polymerase (BD PharMingen). Hybridization with 5–15 μg of RNA was performed for 12–14 h at 56°C, and the products were digested with RNase A and T1 mixture. The samples were treated by proteinase K in proteinase K buffer with yeast tRNA and then extracted with phenol and chloroform:isoamyl alcohol (50:1) and precipitated in the presence of ammonium acetate. The samples were loaded on an acrylamide-urea gel, and run at 40 W with 0.5× Tris-borate/EDTA electrophoresis buffer for 2 h. The gel was adsorbed to filter paper and vacuum-dried, then exposed on film (X-AR; Kodak, Rochester, NY) with intensifying screens at −70°C. The films were scanned and densitometry performed using Quantity One software (BD Biosciences). Absolute RNA levels were calculated using 2- to 4-h exposures of housekeeping gene expression and normalized using Quantity One software. Statistical analysis of the results was performed using Staview 4.0 (Abacus Concepts). We previously demonstrated that bulk populations of NOD spleen or lymph node cells demonstrated increased entry into the IFN-γ effector pathway. We wanted to demonstrate whether this phenotype required the presence of APCs. We stimulated minimacs-purified naive spleen and lymph node CD4+ cells from NOD vs B6.G7 mice with plate-bound anti-CD3 and titrated anti-CD28. NOD CD4+ T cells demonstrated increased IFN-γ effector pathway entry, measured by intracellular cytokine analysis, at each dose of anti-CD28 compared with B6.G7 CD4+ T cells (Fig. 1⇓). These results suggested that the increased NOD IFN-γ entry was CD4+ T cell intrinsic. Increased intracellular IFN-γ production in anti-CD3/CD28-stimulated NOD vs B6.G7-purified CD4+ cells. a, NOD and B6.G7 CD4+ cells were purified from whole spleen preps from naive female mice aged 8 wk using minimacs magnetic bead sorting. Cells were cultured with plate-bound anti-CD3 and soluble anti-CD28 in titrated concentrations, and analyzed at day 3 for IFN-γ production using intracellular cytokine analysis. b, Graphic representation of results. One representative of four experiments is shown. We next assessed intrinsic CD4+ T cell cytokine production using ribonuclease protection analysis (Fig. 2⇓). 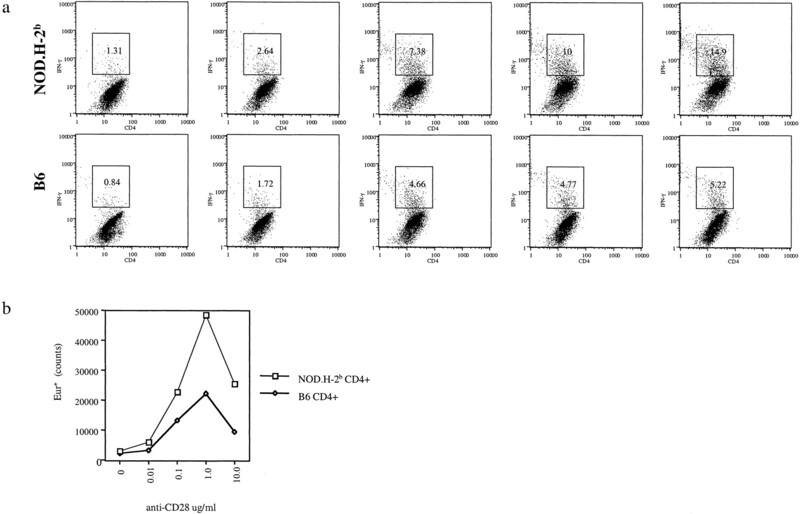 Purified NOD CD4+ T cells, stimulated with anti-CD3/CD28, produced more IFN-γ, less IL-4, and less IL-10 mRNA message than purifiedB6.G7 CD4+ T cells (Fig. 2⇓). Quantification of cytokine message content consistently showed a low B6.G7 CD4+ T cell ratio of IFN-γ to both IL-4 and IL-10 (Table I⇓). However, NOD CD4+ T cells demonstrated a “dsyregulated” cytokine message ratio, derived both from increased IFN-γ and decreased IL-4 and IL-10 (Table I⇓). These results showed that the intrinsic NOD CD4+ T cell effector phenotype was due to both increased IFN-γ as well as decreased Th2 cytokine production. Increased IFN-γ, decreased IL-4, and decreased IL-10 mRNA expression in anti-CD3/CD28-stimulated NOD vs B6.G7-purified CD4+ cells. CD4+ T cells were purified and stimulated as in Fig. 1⇑. RNA was extracted and RNase protection analysis performed as in Materials and Methods. NOD CD4+ cells consistently demonstrated increased IFN-γ, decreased IL-4, and decreased IL-10 mRNA compared with B6.G7-purified CD4+ T cells. One representative of four experiments is shown. The exposure is 24 h; exposure used for housekeeping gene expression for quantification was 2–4 h (see Materials and Methods). The quantification of the experiments is shown in Table I⇓. As we previously published, we have found no evidence that the NOD T cell abnormality was due to increased preactivated or memory autoreactive T cells in the NOD periphery in these 8-wk-old mice (35). The results predict that the same phenotype should be found in a nondiabetes prone strain with the NOD non-MHC background. We confirmed that purified anti-CD3- and anti-CD28-stimulated CD4+ T cells from NOD.H2b vs B6 mice showed an increased entry into the IFN-γ pathway compared with purified B6 CD4+ T cells (Fig. 3⇓a). The increased number of IFN-γ-positive cells was associated with an increased extracellular protein production (Fig. 3⇓b), suggesting that more cells entered the IFN-γ pathway, rather than that each cell made more protein. The NOD.H2b CD4+ T cells also made more IFN-γ and less IL-4 RNA by RNase protection assay analysis when compared with B6 CD4+ T cells (data not shown). These results support the hypothesis that the NOD non-MHC genetic background drives an enhanced IFN-γ:IL-4 effector ratio intrinsic to CD4+ T cells, in the presence or absence of the autoimmune diabetes disease process. Increased intracellular IFN-γ production in anti-CD3/CD28-stimulated NOD.H2b vs B6-purified CD4+ cells. a, NOD.H2b and B6 CD4+ cells were purified, stimulated, and assayed as in Fig. 1⇑. NOD.H2b CD4+ cultures consistently demonstrated greater numbers of IFN-γ+ cells. b, Purified CD4+ cells were stimulated as in a, and at 48 h supernatants collected for IFN-γ protein production analysis (see Materials and Methods). One representative of four experiments is shown. Cytokine expression in CD4+ T cells has been associated with the cell cycle, and NOD thymocytes demonstrate a proliferative defect (30, 37, 38). We investigated whether the NOD CD4+ T cell cytokine dysregulation was related to differences in cell cycle machinery between NOD and B6.G7 CD4+ T cells. We stained purified CD4+ T cells with CFSE, stimulated them with anti-CD3/CD28, and followed the kinetics of entry into the IFN-γ effector pathway using intracellular cytokine analysis (Fig. 4⇓). NOD and B6.G7 CD4+ T cells demonstrated identical cell division machinery in response to anti-CD3 and anti-CD28, with identical percentages of cells dividing at each time point (Fig. 4⇓, a and b). However, NOD CD4+ T cells showed a markedly increased number of IFN-γ-positive CD4+ cells compared with B6.G7 at each subsequent cell division, despite identical numbers of cycling cells (Fig. 4⇓c). These results suggest the differential NOD cytokine effector entry is not related to cell cycle machinery differences between NOD and B6.G7. In addition, these results demonstrated no genetically controlled abnormality in NOD T cell cycle (proliferative) capacity. Identical cell divisions but differential IFN-γ production in NOD vs B6.G7 CD4+ T cells. NOD and B6.G7 CD4+ cells were purified and stimulated as above after being prestained with CFSE (see Materials and Methods). Intracellular cytokine analysis was performed as above (Figs. 1⇑ and 3⇑). Analysis was performed at days 1, 2, and 3 of stimulation. One representative of three experiments is shown. The CFSE results showed no difference in cell division capacity of NOD vs B6.G7 CD4+ cells. We dissected the NOD vs B6.G7 cell division machinery further using 7-AAD and BrdU analysis of specific phases of cell cycle entry. NOD and B6.G7 showed identical entry into G0/G1, S, and G2 + M phases of the cell cycle (Fig. 5⇓, a and b). In addition, both NOD and B6.G7 showed IFN-γ expression predominantly in S phase cells (Fig. 5⇓c). These results further support the hypothesis that in this genetic system, NOD CD4+ T cells are characterized by a dysregulated cytokine effector phenotype, controlled by the NOD non-MHC genetic background, and independent of cell cycle machinery. Figs. 4⇑ and 5⇓ provide evidence against the hypothesis of a peripheral NOD T cell cycle/proliferative defect. No difference in cell cycle entry between NOD and B6.G7 spleen cells. NOD and B6.G7 spleen cells were stimulated with Con A and PMA/ionomycin as described in Materials and Methods. Cell cycle analysis using BrdU and 7-AAD, and intracellular cytokine were performed as described in Materials and Methods. One representative of three experiments is shown. These results suggested that the NOD cytokine phenotype shown in this study and in our previous work was T cell intrinsic. To further support this hypothesis, we performed a different experiment using NOD and B6.G7 CD4+ T cells cultured with and stimulated by Con A (see Materials and Methods) in the presence or absence of either NOD or B6.G7 APCs (Fig. 6⇓a). NOD and B6.G7 CD4+ T cells cultured under these conditions in absence of APCs produced no significant IFN-γ (Fig. 6⇓a). Addition of APCs was necessary to generate IFN-γ, and NOD CD4+ T cells generated more IFN-γ than B6.G7 T cells after addition of APCs (Fig. 6⇓a). However, as Fig. 6⇓b demonstrates, the genetic background of the APC did not affect the amount of IFN-γ produced, i.e., NOD T cells generated more IFN-γ than B6.G7 CD4+ T cells regardless of the APC genetic background. We obtained the same results when assaying for intracellular IFN-γ production (Fig. 7⇓). Purified NOD CD4+ T cells, whether cultured with NOD or B6.G7 APCs, showed an increased IFN-γ effector entry compared with B6.G7 CD4+ T cell cultured with either NOD or B6.G7 APCs (Fig. 7⇓, a–c). Therefore, B6.G7 APCs could not “correct” the NOD T cell effector cytokine phenotype, nor could NOD APCs “divert” the B6.G7 CD4+ effector phenotype. Furthermore, NOD CD4+ T cells, whether cultured with NOD or B6.G7 APCs, showed the increased IFN-γ to IL-4 cytokine effector ratio as measured by RNase protection analysis of cytokine RNA (Fig. 7⇓d and Table II⇓). NOD CD4+ T cells, on either NOD or B6.G7 APCs, showed a dysregulated IFN-γ:IL-4 cytokine ratio. In contrast, B6.G7 CD4+ T cells, on either NOD or B6.G7 APCs, showed a remarkably conserved or “regulated” IFN-γ:IL-4 cytokine ratio unchanged from the anti-CD3/CD28 studies above (Table II⇓ cf Table I⇑). These results strongly support the hypothesis that NOD CD4+ T cells have an intrinsic dysregulation in cytokine expression compared with B6.G7 CD4+ T cells. Mixing studies demonstrate that increased NOD CD4+ IFN-γ is independent of APC genetic background. 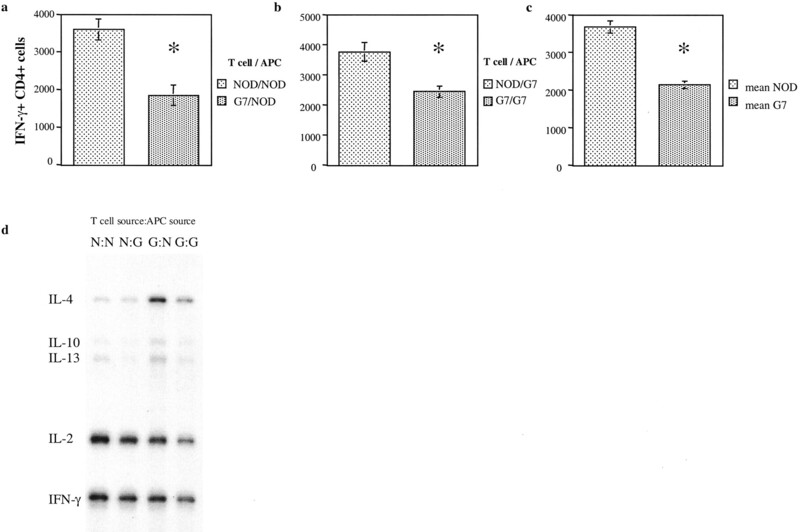 a, NOD and B6.G7 CD4 cells alone or with Con A alone do not generate significant amounts of IFN-γ. 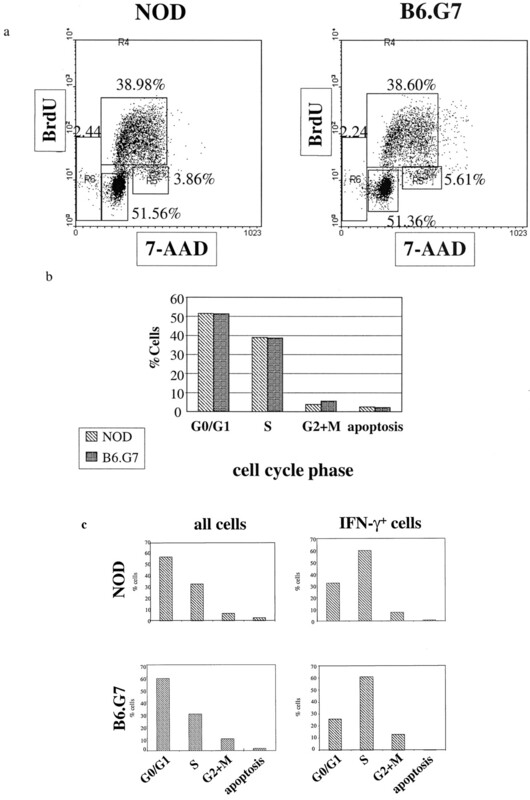 NOD CD4+ T cells cultured with Con A and APCs generated more IFN-γ than B6.G7 CD4+ cells. 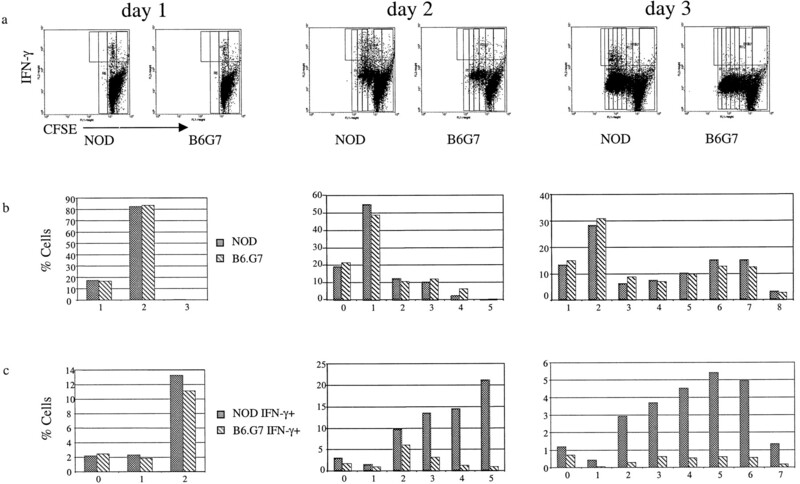 b, Purified NOD CD4+ T cells cultured with either NOD or B6.G7 APCs generated more IFN-γ than B6.G7 CD4+ T cells cultured with either NOD or B6.G7 APCs. Europium fluorometry performed as in Fig. 3⇑b. One representative of three experiments is shown. Mixing studies demonstrate that increased NOD CD4+ T cell entry into the IFN-γ pathway is independent of APC genetic background. a–c, NOD and B6.G7 CD4+ cells were purified and cultured with either NOD or B6.G7 APCs and stimulated by Con A/PMA/ionomycin as described in Materials and Methods. Intracellular cytokine determination of IFN-γ+ cells was performed at day 3. Mean of four experiments is shown. Values of p: a, p = 0.004; b, p = 0.03; and c, p = 0.01. d, RNase protection analysis performed as in Fig. 2⇑ on cells purified and cultured as in a–c. One representative of three RNase protection assays is shown. Quantification of expression levels is shown in Table II⇓. Costimulation of T cells via the CD28 receptor plays a critical role in tolerance, T cell activation, and T cell effector function (39). It has been reported that loss of CD28 signaling can worsen NOD diabetes, or that stimulation through CD28 can ameliorate diabetes (40, 41). We looked for differences in the quantity or kinetics of CD28 expression, which might mediate differential cytokine expression in NOD vs B6.G7 CD4+ T cells. We found no difference in CD28 expression in NOD vs B6.G7 T cells at any time point (Fig. 8⇓), thus suggesting that decreased CD28 expression is not playing a role in the differential cytokine profile of NOD vs B6.G7 T cells. 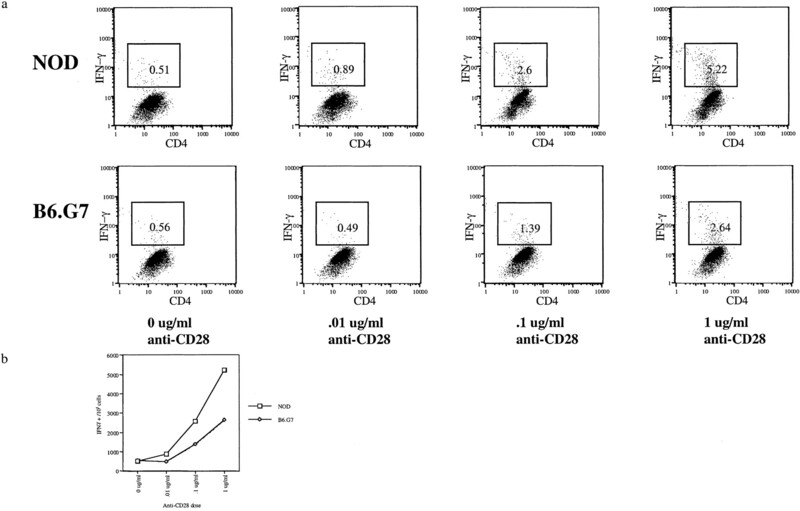 No difference in CD28 expression on anti-CD3/CD28-stimulated NOD and B6.G7 CD4+ cells. CD4+ cells were purified and stimulated as in Fig. 1⇑ and CD28 expression measured at time zero and days 1–3. One representative of three experiments is shown. We have shown that CD4+ T cells developing on an NOD non-MHC genetic background develop an increased IFN-γ:IL-4 effector phenotype which is CD4+ T cell intrinsic, and independent of the cell cycle machinery or APC genetic background. Purified NOD CD4+ T cells stimulated only with anti-CD3 and anti-CD28 entered the IFN-γ pathway in greater numbers, and generated a cytokine mRNA ratio skewed toward Th1 (Figs. 1⇑ and 2⇑, and Table I⇑). Purified NOD.H2b vs B6 CD4+ T cells showed the same phenotype (Fig. 3⇑). Using an assay designed to test the possible role of APCs in this phenotype, we showed that purified NOD CD4+ T cells stimulated with either NOD or B6.G7 APCs generated more IFN-γ than purified B6.G7 CD4+ T cells, i.e., that even in an assay where cytokine production is APC dependent, NOD CD4+ T cells generate more IFN-γ regardless of the APC source, compared with B6.G7 CD4+ T cells (Figs. 6⇑ and 7⇑, and Table II⇑). We hypothesize that a subset of Idd susceptibility genes (23) may act to control intrinsic NOD CD4+ T cell effector function. The implication of a dysregulated CD4+ T cell in the periphery would be an exaggerated Th1 predominant immune response poorly susceptible to feedback suppression. An immune response mediated by B6.G7 CD4+ T cells would result in a balanced expression of cytokines and coordinated regulation of the response. In contrast, the NOD CD4+ T cells would perpetuate Th1-mediated immunity to excess (as reflected in the large cytokine ratios shown in Tables I⇑ and II⇑), leading to a loss of peripheral tolerance. Thus, even in a strain (B6.G7) which shared a disease-associated MHC class II molecule (which could result in defective negative selection), i.e., a strain with the same number of potentially autoreactive TCRs (B6.G7; Refs. 28 and 29), could nevertheless avoid autoimmunity via peripheral tolerance mechanisms. The present work presents strong evidence for an intrinsic NOD CD4+ T cell dysregulation of peripheral cytokine effector phenotype; however, it does not exclude a role for APCs in the development or maintenance of the T cell phenotype. APCs could contribute to the T cell phenotype either in the thymus or in the periphery. A body of work has established NOD APC defects (42). It is likely that NOD APC defects could act, in conjunction with the NOD I-Ag7 MHC class II molecule, in the thymus to select a population of T cells which demonstrate the defects in peripheral tolerance shown in this study (42). This hypothesis is testable and the focus of ongoing work in our lab. Notably, our detailed studies of NOD T cell cycle kinetics (Figs. 4⇑ and 5⇑) showed no evidence for a genetically controlled NOD T cell peripheral cell cycle/proliferative defect to explain the NOD T cell cytokine abnormalities. NOD CD4+ T cells were identical with B6.G7 CD4+ T cells in capacity to divide (Fig. 4⇑) and in entry to specific cell cycle phases (Fig. 5⇑) even while generating significantly more IFN-γ+ cells (Fig. 4⇑). These results strongly suggest that peripheral genetically driven cytokine differences in NOD T cells are not related to cell cycle machinery, rather the results point to a fundamental defect in NOD CD4+ T cell signaling as it mediates cytokine phenotype. Similarly, we see no difference in CD28 expression of peripheral T cells, although CD28 can clearly play a role in NOD disease pathogenesis (40, 41). It is possible that CD28 signaling rather than expression levels is a critical parameter. The control of CD4+ T cell effector phenotype is under active investigation. Clearly, cell surface signaling can mediate transcription factor expression which can divert a naive T cell to a Th1 or Th2 phenotype (43, 44, 45). For example, CD4+ cells from c-maf-deficient mice are defective in IL-4 production, and transgenic mice expressing c-maf can prevent diabetes induction in some models (however, not on the NOD genetic background) (46, 47). Stat-6 knockout T cells show defective Th2 induction (48, 49). Transgenic mice with a dominant-negative form of GATA-3 show decreased IL-4, 5, and 13 production (50). Therefore, any number of defects in the cytokine effector pathway could divert the NOD CD4+ T cell toward a predominant Th1 phenotype. Future work will characterize the cytokine signaling pathways in NOD CD4+ T cells to clarify these issues. The large body of evidence suggesting that CD4+ Th1-mediated T cell effects are pathogenic in autoimmunity suggests that characterization of the genetic control of an excessive NOD Th1 response may lead to new insights into autoimmune pathogenesis in general. ↵1 This work was supported by the Juvenile Diabetes Foundation, a Pfizer Scholars Grant, and the Competitive Medical Research Fund of the University of Pittsburgh School of Medicine (to W.M.R.). ↵3 Abbreviations used in this paper: NOD, nonobese diabetic; Idd, insulin-dependent diabetes; BrdU; 5-bromo-2′-deoxyuridine; 7-AAD, 7-aminoactinomycin D.
Prochazka, M., E. H. Leiter, D. V. Serreze, and D. L. Coleman. 1987. Three recessive loci required for insulin-dependent diabetes in nonobese diabetic mice [Published erratum appears in 1988 Science 242:945.]. Science 237:286. Delovitch, T. L., and B. Singh. 1997. The nonobese diabetic mouse as a model of autoimmune diabetes: immune dysregulation gets the NOD [Published erratum appears in 1998 Immunity 8:531.]. Immunity 7:727.